Are You Walking in Wisdom? This book will open your eyes, your heart, and your Spirit as you journey through each letter written to the Church. It is very much like the previous book, Jesus is Coming-Soon, Are You Rapture Ready? -- which was penned in the same manner as the letters written to the Church, by the Apostle Paul. The Pauline Letters, Romans, 1 & 2 Corinthians, Galatians, Ephesians, Philippians, Colossians, 1 & 2 Thessalonians, 1 & 2 Timothy, Titus, and Philemon, were written under the guise of the Holy Spirit. Each letter, in Jesus is Coming Soon: Book II, Are You Walking In Wisdom? as well as the previous book, Jesus is Coming-Soon, Are You Rapture Ready? are both written under the tutelage of the Holy Spirit for todays Church. This book contains thirty one letters. It addresses distinct circumstances of the End Time Church. It can be read in succession or by a selection of the topic that interest you most. Each letter stands alone and is not to be considered a prerequisite of another. 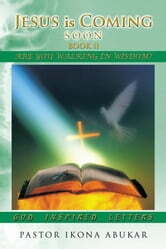 This book is meant to revive you and launch you into the newness of life. It will prick your conscience and cause you to check your walk with Christ. How Do I Get Rid of a Ghost?